While extraordinary claims demand extraordinary evidence, I am always amazed when claims which are obvious in hindsight, even mathematical theorems, are treated sceptically. Maybe it is because people don't want to admit that they are ashamed that they didn't think of it first. Feynman's Nobel Prize pivoted on a V−A (left-handed) Lagrangian for weak interactions. Everybody knew it was S-T. It had to be S-T. Sudarshan was correct much earlier on. He was told to piss off, as were Yang and Lee. Yang and Lee had Madame Wu. Feynman had Feynman (and Gell-Mann). Sudarshan got nothing. Gravitation is not a fashion statement. The plural of "anecdote" is not "data," and data are not information. Why must the vacuum be fundamentally continuous and isotropic toward fermionic mass? I dunno, Al. Why not? You tell us. Also, thanks Bee, for this wonderful blogpost. I can't help thinking though, you've only told us half a story, which is cool, because it builds interest therefore anticipation. This is the sort of stuff that makes Science fun! Can't wait to hear how this pans out. Good on ya. I am just trying to orientate from your perspective. :)At that Planck length of course one runs into trouble with some geometrical description so how indeed would some quasi-description ever be satisfied as to defining the shape of things in a matter orientated world? Sir Roger Penrose of course has his own ideas too. What is the basis of his experimental views? Your choice of font makes it difficult to perceive italicized elements of quoted sources as they are demonstrated in comment section. Has comment section been given an italicized choice? This is new I think? If no desire to change will adapt to the way quotes are demonstrated according to that selection. No problem for the future. Shouldn't that be generalized to a Planck volume instead? Which you could combine the the Heisenberg uncertainty principle to ensure that singularities are not observable? The derivation of the Heisenberg principle, interestingly enough, does not involve the electric charge, i.e., how the photon couples to the particle is not relevant. Δ x ≥ fine structure constant * compton wavelength (or some such). Since the gravity bound is much more stringent than this, I can see why people were skeptical of Mead's argument. The Compton wavelength limit normally would have a priority. But I guess he considers non relativistic physics only. and what is the relation with the Compton wavelength? I am probably misunderstanding the question. The Compton wavelength of what? 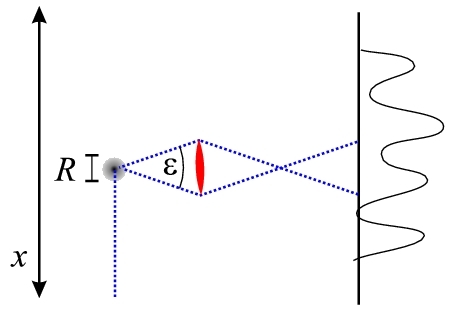 The Compton wavelength as a limit for which positions measurements become ill defined due to creation of particles. I mean if the energy of the photon exceeds some limit according to QFT particles would be created. The photon's energy always exceeds the Planck energy in some restframe. But yes, if that is what you mean, if it interacts with the particle at very high energies, a microscope isn't anymore a very good analogy since, as you say, you'd have a very inelastic scattering and you'd have to figure out what was going on from the outgoing particles rather than watching photons on a screen. Thanks Bee for taking the time to answer these questions. Where could I get a free copy of the paper? I am very interested into study it! This link expires in 10 days. Given frequency, wavelength inversely varies with refractive index. Anomalous dispersion reduces local speed of light to 340 m/s (ruby), to 17 meters/sec (BEC), and to zero. Electromagnetic Planck length may suffer interaction wildly altering scale. Gravitation is interaction. Equivalence Principle (EP) composition, field, and photon tests are inert to 5x10^(-14) difference/average. Physics cannot derive fermionic mass parity asymmetries. They are manually inserted. If gravitation is geometry, the test is massed geometry. Opposite shoes violate the EP. Chemically and macroscopically identical, enantiomorphic crystal lattices violate the EP. 1) Left- versus right-handed alpha-quartz or gamma-glycine single crystals, Eotvos experiment. 2) North-south aligned enantiomorphic crystal lattices and changing enthalpies of fusion to identical achiral melts over 24 hours, benzil. Physics, like Euclid, contains no errors. Euclid fails on a sphere. Falsification occurs external to founding postulates. It’s indeed interesting to wonder what if anything can be defined as the minimum of length and yet as J.S. Bell would point out quite another thing to consider what exactly it is we are attempting to have measured as to be so defined. Does lightphotons and neutrinos interact at all? Neutrinos are still leptons? At c does the photon behave relativistic also then? A photon is massless. c is measured by em-force as Uncle Al points out. You say Planck energy is always higher. 1) Nothing smaller than these density fluctuations can be observed there in similar way, like the objects outside of visibility scope of landscape under the fog. 2) These Universe at such small scales doesn't differ from our Universe at the human observer scale, we just cannot observe it clearly because of omnipresent quantum noise. L.H. Thomas used something Frame like to analyze the precession of the electron, parallel transported around an orbit, so something is not quite a geometrical point. Perhaps one might argue that quanta are more fundamental than idealized spacetime geometry, but merely consistent with it. Just as exceeding the speed of light is "impossible" because it would turn time "inside out," so exceeding the Plank length limit is "impossible" because it would turn space "inside out." So maybe this is where we need to look when we look for those tiny, curled up "extra dimensions." About the speed of light limit. I would like to say that in multitemporal relativities in which other speeds of light could appear (I know, it is a crazy idea, there is no evidence of that although DM/DE are puzzling too, and people usually argue hardly against multitime theories and other geometries beyond the riemannian one), and other extensions of relativistic symmetries, the limit is no longer a limit. The speed of light limit is closely related to the Lorentz invariance of our 3+1 world. Either if you change the (pseudo)riemannian structure of the theory, or you include new "degrees of freedom" like extra-times (curiously it doesn't happen with spatial-like coordinates) or some other multivector structures related to Finsler-like objects, there is no problem with speeds greater than c. If vacuum is some kind of medium, it is also reasonable that could exist something faster than light. I found myself puzzled when Bee published her paper about quantum superpositions of speeds of light. Indeed, there is something there to be understood better.